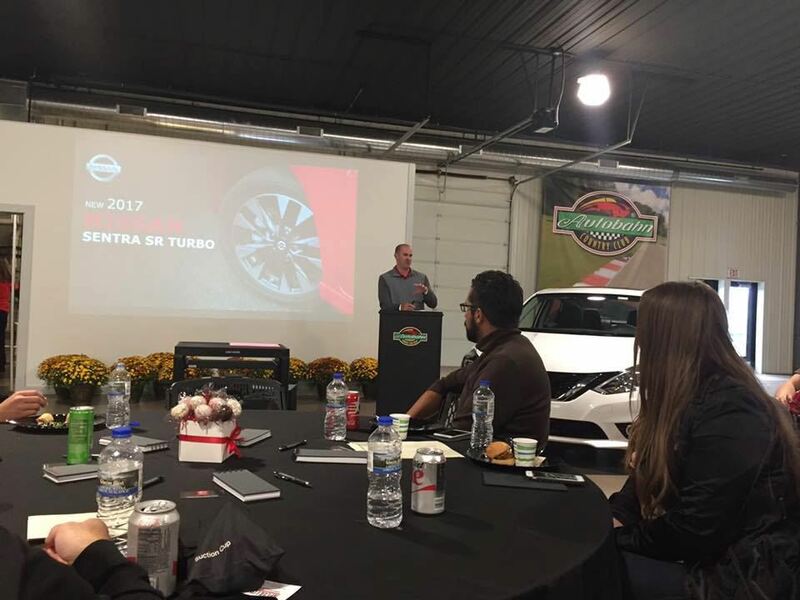 Members of the Midwest Automotive Media Association (MAMA) were among the first to experience the Nissan Sentra SR Turbo this week during its 2016 Fall Rally. Brandon White, Nissan’s director of small cars, highlighted the sporty sedan’s enhancements during a lunch presentation with a menu made up of “small and quick” bites that foreshadowed the topic of the conversation. 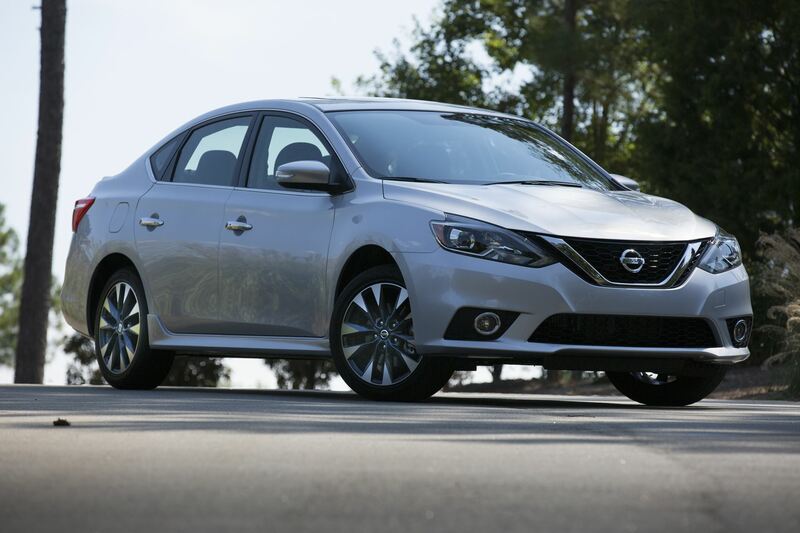 Overall, Nissan says it made major enhancements to the Sentra focusing on steering, braking and suspension. 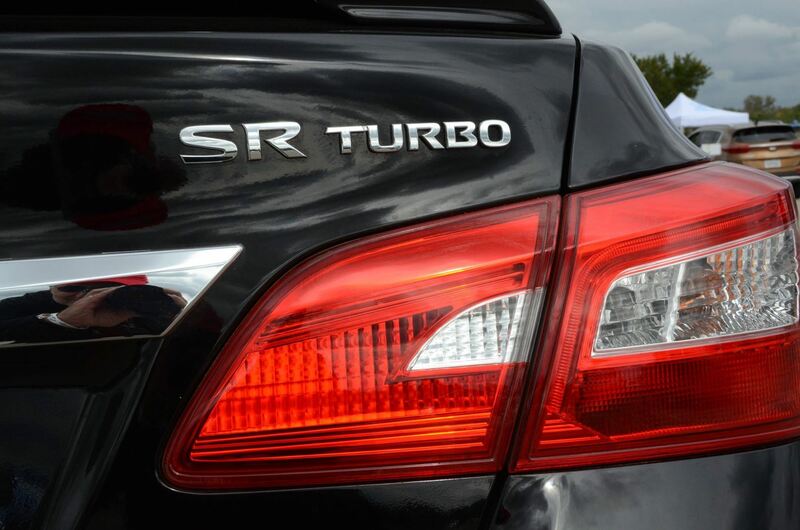 The Sentra SR Turbo has a brand new, 1.6-liter direct injection gasoline turbocharged engine, putting out 188 hp and 177 lb.-ft. of torque. On the exterior, LED headlights, LED brake lights, front fog lights and LED side-mirror turn signals all come standard. On the inside, people are surprised to find a rather large interior for a small car. Despite the car’s measurements, the Sentra has a roomy backseat and a tall ceiling, creating a spacious and comfortable environment for passengers. The Sentra is also a great value starting at just under $22,000. A premium option package is available with leather seats, Bose audio and blind-spot monitors. Navigation is also an add-on option. Southfield, Michigan – The Steel Market Development Institute (SMDI), a business unit of the American Iron and Steel Institute (AISI), is partnering with the Midwest Automotive Media Association (MAMA) for its annual Fall Rally, held at the Autobahn Country Club in Joliet, Illinois. In addition to the annual event for automotive journalists, MAMA is celebrating its 25th anniversary. The event includes a mix of approximately 70 vehicles and attendees will hear presentations from automakers and other sponsors, and attendees will be able to participate in a variety of driving scenarios – including track, street and off-road. MAMA’s Fall Rally and its Spring Rally events allow members to test drive MAMA Family Vehicle of the Year contenders, which is awarded at the Chicago Auto Show, held annually in February. Oakbrook Terrace, Illinois – While sometimes overlooked by the average consumer, commercial vehicles play a critical role in the growth of new industries, small businesses, construction and delivery companies. 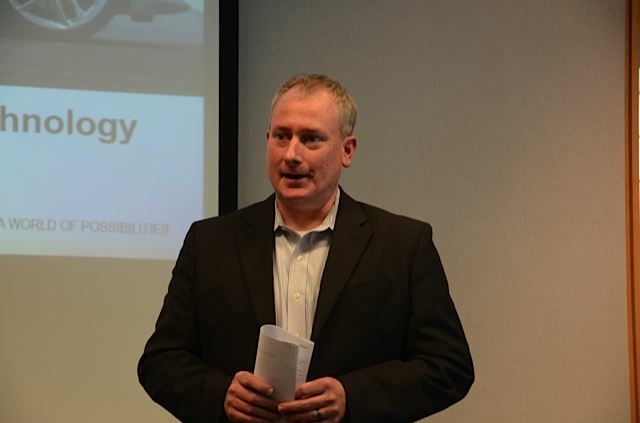 Dave Sowers, head of Ram Commercial Trucks, took time to relay the importance of this fast-growing segment to the Midwest Automotive Media Association during MAMA’s August meeting. Unsurpassed towing capacity – 2,000 lbs. After a delicious lunch and presentation, MAMA members walked outside to check out three Ram trucks on display: ProMaster City, ProMaster and Ram Chassis Cab. An up fitted Ram ProMaster showcased Bosch tools and provided greater insight to how businesses use these large vans. Whether focusing on a family that uses a Ram 1500 day-in and day-out, a hard-working Ram 3500 Heavy Duty owner or a business that depends on its Ram ProMaster commercial van every day for deliveries, Ram has the truck market covered. SOUTHFIELD, Michigan – The Steel Market Development Institute (SMDI), a business unit of the American Iron and Steel Institute (AISI), is partnering with Dodge and the Midwest Automotive Media Association (MAMA) for the second annual Track Driving School program, held at GingerMan Raceway in South Haven, Michigan, on July 20. Automotive journalists will begin with a classroom style lesson from the pros and then get hands-on driving experience on the track with the professional track driving instructors. The vehicle lineup includes the steel-intensive Dodge Charger, Dodge Challenger and Jeep Grand Cherokee SRT vehicles. Formed in 1991, MAMA has more than 240 members and brings together journalists and public relations professionals involved in the automotive industry. The MAMA Track Driving School began in 2015 as an opportunity for members to learn the nuances of driving on a race track with trained professionals. Of the numerous regional automotive press associations across the country, this type of event is unique to MAMA and developed in direct response to member requests and the need for high performance driver training to enable safe new vehicle evaluations. AISI serves as the voice of the North American steel industry in the public policy arena and advances the case for steel in the marketplace as the preferred material of choice. AISI also plays a lead role in the development and application ofnew steels and steelmaking technology. AISI is comprised of 19 member companies, including integrated and electric furnace steelmakers, and approximately 125 associate members who are suppliers to or customers of the steel industry. SMDI increases and defends the use of steel by developing innovative materials, applications and value-added solutions for customers in the automotive, construction and packaging markets. SMDI automotive investors include: AK Steel Corporation,ArcelorMittal and Nucor Corporation. For more information on SMDI, visit www.autosteel.org or follow @SMDISteel on Twitter. OAKBROOK TERRACE, Illinois – Mecum Auctions presented during the monthly Midwest Automotive MediaAssociation meeting last week and gave members an insight into its world. Mecum is a world leader of collector cars, vintage and antique motorcycle, and Road Art sales, hosting auctions throughout the country. They’ve been specializing in collector car sales for 29 years and has become a well-established organization. · Mecum receives 20,000 entries per year. · Averages more than one auction each month with events scattered throughout the country. · Generates $100 million in sales – in just the Chicago market alone. · 9 semi-trucks needed to bring the auction supplies to each location. · 200-250 Mecum staff needed to run the auctions. · 40 staff to run the TV show (on NBCSN) – for show times, click here. · Each minute of the auction, there’s a new car featured on the block – talk about action-packed. · 60-70 cars on average are sold per event. Another fun statistic: there are 2.6 million collector cars out there, but only 1 percent trade hands domestically. So, why the need for an auction and not just sell the cars? According to Mecum, the competitive spirit changes the mindset a bit and excites buyers. They feel a sense of competition and a desire to have the vehicle on the block – there’s not a lot of time to think the decision through. However, Mecum doesn’t have too many issues with buyers’ remorse. Only 2-3 percent of people regret their decision and try to get out of the deal. Overall, it was a very engaging and interesting meeting and members had tons of questions. Mecum certainly left attendees wanting more. Good news for MAMA members, Mecum has offered a media pass to MAMA members to attend the Chicago 2016 Mecum Auction at the Schaumburg Convention Center, Oct. 6-8. To obtain your pass, contact David Morton, Mecum Manager of Communications and Event Marketing, at DMorton@mecum.com. For more information on Mecum Auctions, visit Mecum.com. 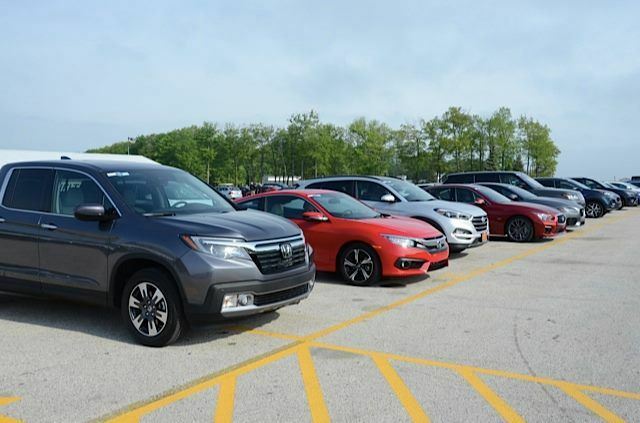 CHICAGO, Illinois – Honda took advantage of the beautiful Chicago summer weather and hosted a picnic for MAMA members this week to show off the 2017 Ridgeline truck -- which just so happened to go on sale that same day. 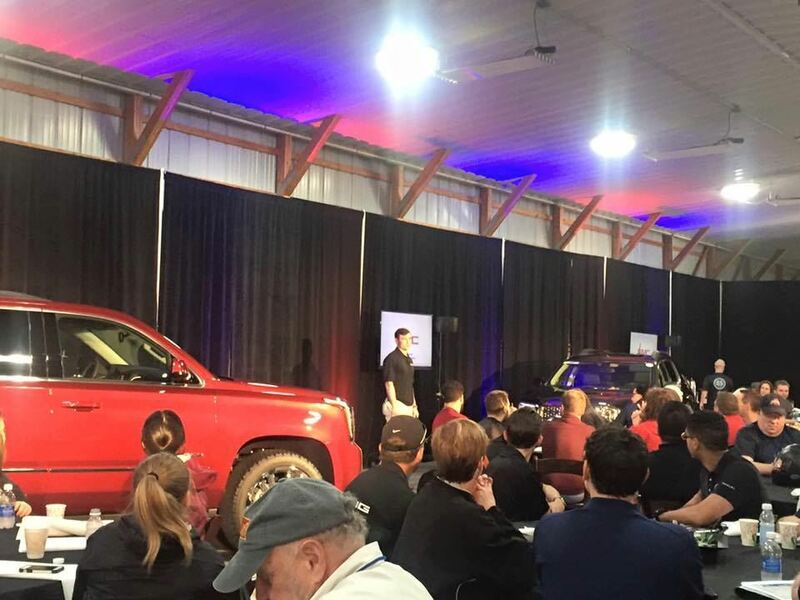 Honda’s Public Relations Manager James Jenkins provided MAMA members an overview of the new Ridgeline – from a PowerPoint featured on a TV screen mounted to the back of the truck bed. Note: the truck offers an in-bed AC power outlet turning the entire bed into an audio system. Overall, Jenkins said the new truck offers better ride comfort, better traction, better stability on and off the road, independent suspension, best active AWD in the market and a stronger, lighter body. The Ridgeline’s V6 engine provides top-of-class fuel economy delivering a city and highway combined 22 miles. MAMA members enjoyed cold soda out of the Rideline’s lockable in-bed trunk (that can fit an 82-inch cooler!) that was filled to the brim with ice and an assortment of beverages. The bed length measures 64” long with tailgate, and 60” wide at bed walls. The truck has a maximum tow rating of 5,000 lbs. and a payload rating of 1,499 for the AWD RTL-E trim. Additionally, Honda says the Ridgeline’s best-in-class rear seat cargo space can fit an adult bike without removing a wheel. On the interior, the Ridgeline features an 8” infotainment touchscreen interface, ambient lighting, smart start and a heated steering wheel. For safety, Honda Sensing offers adaptive cruise control, lane keeping assist, road departure mitigation, CMBS (vehicles and pedestrians), forward collision warning and lane departure warning. Additional assist features include blind spot information, rear cross traffic monitor and LaneWatch. The Ridgeline starts at an MSRP of $29,475 for 2WD and tops out at $42,870. ELKHART LAKE, Wisconsin –Automakers and journalists once again descended on Road America this week, which has become home to the Midwest Automotive Media Association (MAMA) Spring Rally. An annual favorite, the two-day event draws top journalists from the across the country where they’re able to experience approximately 100 of the industry’s hottest vehicles. This year not only marks MAMA’s 15th Spring Rally, but also the association’s 25th anniversary. Nearly 100 media and more than 60 manufacturers and affiliate members attended. The first evening, the Chicago Automobile Trade Association (CATA) sponsored the traditional Wisconsin fish fry dinner for manufacturers and out-of-town journalists. This event has become an annual favorite “warm welcome” that reunites industry colleagues and friends. The first morning opened with a breakfast hosted by GMC where the brand introduced the 2016 Yukon SLT Premium Edition – a chrome-trimmed special model offering a premium, personalized appearance on SLT models. Following, CGI Motorsports hosted a track safety talk and then rally-goers were cut loose to take on the track and street drives. Following two hours of hot laps and test drives of Family Vehicle of the Year award contenders, Nissan sponsored a “farm to table” themed lunch where a brand executive provided detail on the LEAF. The lunch ended with a fun surprise for guests – Nissan treated everyone to smoothies made in blenders powered by the LEAF. More track and street driving occurred, with go-karting (sponsored by Kia) closing out the afternoon. A quick attire change later, members were back at the Osthoff Resort for dinner, sponsored by General Motors and MAVEN Mobility. During the dinner, the Chicago Auto Show presented its “Best of Show” awards: “Best Exhibit” to Chevrolet; “Best Green Vehicle” also went to Chevrolet for the Volt; “Best All-New Production Vehicle” went to the Lexus LC 500; and “Vehicle I’d like to have in my driveway” went to the Ford GT. The night, per usual, concluded at Siebken’s Tavern (known as the “best bar on the racing circuit”), libations sponsored by GM and MAVEN. The second morning kicked off with a breakfast hosted by Chrysler. This venue provided Chrysler the opportunity to highlight the all-new Pacifica and encourage those who haven’t already driven the family hauler to take it for a spin. Back at Road America, journalists could partake in an off-road course, sponsored by Land Rover North America, or street driving. Unfortunately, due to inclement weather, the autocross portion – sponsored by Toyota – had to be cancelled. However, plenty of fun was had on the off-road course and driving vehicles members didn’t have time to test out the previous day. By noon, everyone was hungry again and, thanks to ZF North America, MAMA members had a hearty sendoff lunch of traditional German fare before returning to their respective states. Rally-goers know to stay until the very end as MAMA raffled off a series of prizes provided by the automakers and some affiliate members. In addition, MAMA gave away four Amazon gift cards and a pair of iPads to sweeten the deal. MAMA thanks additional sponsors who helped make the event memorable: Cars.com, Ford, Mazda, Subaru, Volkswagen and Volvo as fuel sponsors; Honda for WiFi; Hyundai for the Snack Oasis; Mercedes-Benz for keeping members safe on the track with helmets; G. Schmitz & Associates for Vehicle Playcards and stickers; and G. Schmitz & Associates and Drive Shop for event logistics. Finally, this featured event couldn’t come together without the hard work of the MAMA Rally Team; the MAMA Board of Directors thank all for their help. The next MAMA event to look forward to will be hosted by Honda for a “Day at the Park!” Honda will have the all-new 2017 Honda Ridgeline loaded with cold refreshments as members enjoy a BBQ lunch and vehicle presentation. That event will be held on June 21 at the UIC Outdoor Picnic Grounds from noon to 2 p.m.
Members should also save the date for the 2016 MAMA Fall Rally which will be held on September 28 at the Autobahn Country Club. Following the track day, MAMA will also host a 25th anniversary party to honor the association’s heritage and success. Stay tuned for more details. ELKHART LAKE, Wisconsin – GMC today announced the 2016 Yukon SLT Premium Edition – a chrome-trimmed special model offering a premium, personalized appearance on SLT models. Yukon and Yukon XL SLT models are powered by an advanced 5.3L V-8 engine that offers the segment’s best V-8 fuel economy: an EPA-estimated 23 highway mpg (2WD models). The Yukon lineup also incorporates technologies that help protect the driver and passengers before, during and after a collision. They include a forward radar system and the segment’s only Front Center Air Bag (models with front bucket seats), which deploys from the inboard side of the driver’s seat and inflates between the driver and front passenger, providing added protection for both front occupants in side impacts. Through Android Auto and Apple CarPlay capability, Yukon’s IntelliLink infotainment system provides simple and intuitive use of smartphones in the vehicle. It integrates certain phone functions onto the 8-inch-diagonal color touch screen, allowing you to call up music, navigation apps and more. Using either application is simple. A “Projection” icon on the IntelliLink screen is visible when a phone is not connected and changes to indicate CarPlay or Android Auto when a compatible phone is connected through a USB. Android Auto requires a phone running the Android Lollipop 5.0 operating system or higher, while Apple CarPlay requires an iPhone 5 or later models. OnStar 4G LTE and available Wi-Fi hotspot complement IntelliLink to enhance Yukon’s connectivity. Fast Fact: Yukon and Yukon XL sales were up more than 11 percent for the first four months of 2016. GMC has manufactured trucks since 1902, with innovation and engineering excellence built into all GMC vehicles. The brand is evolving to offer more fuel-efficient trucks and crossovers, including the Terrain small SUV and Acadia crossover. GMC’s highest-volume vehicle, the Sierra pickup, is the most powerful light-duty pickup on the market, and the first full-size pickup to receive the highest-possible five-star Overall Vehicle Score for safety since the National Highway Traffic Safety Administration changed its New Car Assessment Program for the 2011 model year. Details on all GMC models are available at http://www.gmc.com/, on Twitter at @thisisgmc or at http://www.facebook.com/gmc. OAKBROOK TERRACE, Illinois – Haartz Corporation, the world’s leading supplier of highly-engineered and uniquely designed convertible toppings, presented to MAMA members during the monthly meeting. The supplier shared details of its new Jacquard Weaving Technology, which allows for designed patterns to be included in the topping material of convertibles. Most recently, Jacquard was applied on the 2016 MINI convertible which offers an optional Union Jack featured on the top; the Citroën DS3 which has the logo woven into the topping material; and the 60th anniversary Chevrolet Corvette, which included a blue racing stripe. Haartz also highlighted its full range of capabilities and offerings in various segments including Luxury Cabrios (such as Mercedes C-Class); Ultra-luxury Cabrios (such as the Rolls-Royce Dawn they had on hand for media test drives); SUVs (including the Range Rover Evoque); Semi-Cabrios (Fiat 500C, for example); and Targas (such as the Honda S600 – not available in the U.S.). The company discussed its collaboration with the manufacturers on creating tops that customers desire, and also referenced its growing business in the aftermarket space. Haartz educated members on the market, mentioning they have the lion’s share, but noting the biggest competition for the company is actually other “open air” concepts such as moon roofs. Additional capabilities range from basic formulation of fibers, yarns, fabrics and elastomers to customized design and testing services to suit customer specific needs for material appearance, physical durability, and acoustical performance. For more information on Haartz or its capabilities and products, MAMA members can visit www.haartz.com. OAKBROOK TERRACE, Illinois – The National Safety Council’s Alex Epstein and the University of Iowa’s Dr. Daniel McGehee, from the university’s transportation and vehicle safety research division, served as the guest speakers during the monthly Midwest Automotive Media Association (MAMA) meeting to talk about their new initiative, “My Car Does What?” Perhaps exactly how it sounds, the My Car Does What campaign was designed to put consumers in the driver’s seat when it comes to learning about safety and technology features found in vehicles today. According to the National Safety Council and the University of Iowa, 95 percent of car crashes are due to driver error. However, new vehicle technology can help prevent or greatly reduce the severity of the crash. The technology is out there, but the issue the NSC and the University of Iowa are finding is that consumers do not know much about how the tech works or even how to read some of the icons within their vehicles – ultimately defeating the entire purpose of the technology being present in the vehicle. According to McGehee, one of the most exciting tech advancements out there today is automatic braking. For those within the automotive industry, that term can sound tired – archaic even – when up against some of the forthcoming advancements such as driverless cars; however, the reality is most consumers are far behind this curve. For example, if automatic braking is present within a vehicle, most do not know how to operate it or what signs to look for when it’s about to kick in (i.e. does it kick in at any speed or just after 30 mph?). Studies show that people who know how to use the technology can decrease their risk of an accident, but 40 percent of people reported their vehicle operated in a manner they didn’t expect and 33 percent had to call their dealership or turn to Google for more information. The National Safety Council and the University of Iowa have teamed up to provide an online, mobile- and tablet-friendly resource, MyCarDoesWhat.org, to help educate consumers. The website’s homepage lists the 28 technology and safety features present on vehicles today including: backup camera, antilock braking system, blind spot monitor, automatic emergency braking, lane departure warning, tire pressure monitoring system, adaptive cruise control, adaptive headlights, automatic parallel parking, backup warning, curve speed warning, drowsiness alert, electronic braking assistance, electronic stability control, forward collision warning, high speed alert, hill descent assist, hill start assist, lane keeping assist, night vision, obstacle detection, parking sensors, pedestrian detection, push button start, rear cross traffic alert, road surface warning, sideview camera and traction control. To educate people on the features, each has an identifiable icon next to it. The responsive site is designed to help serve as an easy-to-navigate online manual for people who don’t want to spend hours thumbing through their hard copy booklet. Additionally, the website features videos, easy-to-read infographics and even fun games to help people better understand their vehicle’s functionalities. While there isn’t an industry standard for technology or safety feature terminology (naturally, each brand wants to distinguish itself from its competition), MyCarDoesWhat.org is aimed to help to bridge the gap for people wanting to better understand their car’s current features and determine what’s most important to them when shopping for a new vehicle. Learn more here.